Zinio: A Free Online Newsstand through Your Library! Zinio is an exciting new service offered by the Webster Groves Public Library, along with the Municipal Library Consortium. You can browse and checkout the current issue of over 65 magazine titles. There are no holds, waiting periods or due dates! Each issue that you check out will always be available to you in your Zinio account. 2. Choose ‘Create New Account’ in the top right corner of the screen. 4. Then, enter your information. You must have a password to complete the signup process for Zinio. Your password must have at least 7 characters & include letters and numbers. Tip: The most recent issue will be shown as you browse the list of magazines. Browse back issues (starting July 2013) by clicking on “Back Issues Available” under the cover of the magazine. 6. At this point, you will finish your checkout by creating an account with Zinio. This allows you to access all magazines that you check out from the library. Tip: Use the same e-mail address and password that you used to sign up for the account with the library. This will make things easier when you try to sign into your account to checkout and access your magazine issues. 7. After you have checked out your magazine, you will have the option to “Keep Browsing” or “Start Reading.” Clicking on “Keep Browsing” will allow you to continue checking out magazines. Clicking on “Start Reading” will take you to your Zinio library with all checked out magazines. 8. Magazines issues that are checked out will always be available in your account, unless you manually choose to delete them. Magazines can be deleted by going to your Zinio account and clicking on ‘Edit your reading list’ at the top of the page. Click on the red x over the magazines you would like to delete. 9. After the magazine is checked out you can read it in your browser by clicking on the cover of the magazine, or you can download the app. 10. Download the app for your computer (PC or Mac) by going to www.zinio.com/apps. Zinio Reader 4 will allow you to read magazines that you’ve downloaded onto your desktop or laptop without an Internet connection. The app also allows you to easily access your magazines from the home screen of your computer. * Always use the link from http://www.wgpl.org to Zinio to check out new issues. Accessing magazines from Zinio will only show you issues for purchase. The Zinio app is available for iPhone, iPad, Android, Kindle Fire/Fire HD, NOOK HD/HD+ and Blackberry Playbook. Access the app by going to your App Store (Apple used in the example images). When you open the app, sign in using the account information that you created for the Zinio site in the web browser. After you have signed into your account a list of the magazines that you have checked out will be shown. Click on the arrow next to the magazine to download it to your device. The Zinio app for your tablet or smart phone allows you to read your previously downloaded magazines without an Internet connection. 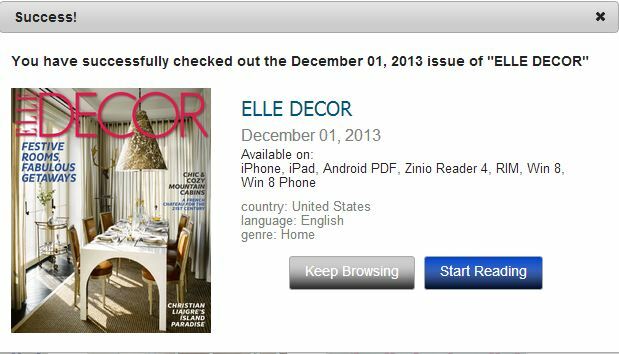 *Like your Zinio account online, you will not be able to browse the library collection in the app. Accessing magazines through the app will only show magazines that are available for purchase.